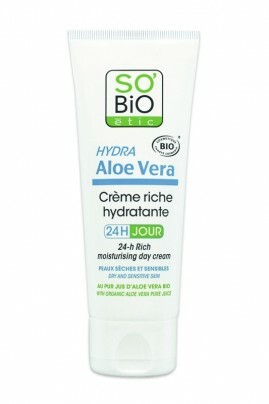 SO'BiO étic Organic Rich Moisturizing Cream hydrates*, soothes and protects dry and sensitive skins. Rich in organic pure aloe vera juice and organic shea butter, this day skincare gives intense comfort and durably moisture*. SO BIO ETIC Organic Face Cream for dry skin leaves your skin smooth and soothed all day long. Dermatologist tested. Fair Trade Organic Shea Butter : nourishing and protecting.